In this example, we have , and . We are looking for . Next, we use distributive property on the right hand side. Recall: . So, the other base is 6 centimeters which is our answer to the problem. 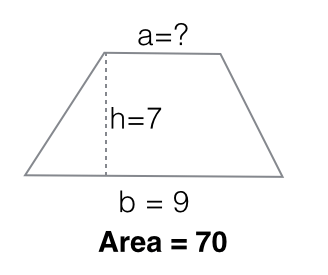 The figure below is a trapezoid. Find the value of . Note: It will be shorter if we divide both sides of equation by 7. You might want to try it. So, the other base of the trapezoid is 11 units. In the next post, we are going to summarize what we have learned from the this series.